Stevo has been doing a new kind of mediation that I wanted to share with you. The wankers are keeping him awake at night, still, so he’s using the time constructively and coming up with new ways to send out Love energy. This one is pretty cool (well, they all are) and I hope many of you will start trying it out. 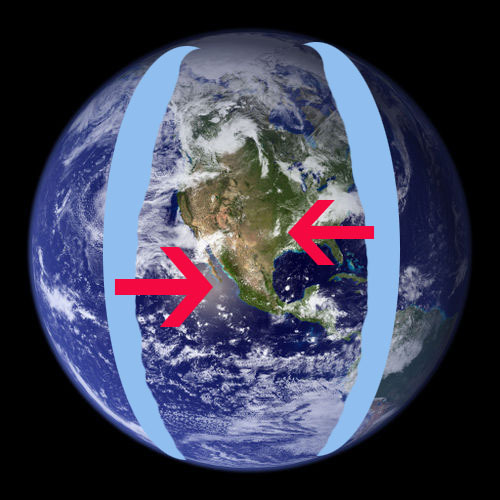 Basically, you imagine the earth with two bands of energy around it, curved from top to bottom on the vertical axis. These bands go around and around the earth, crossing over each other as they pass around the earth, one going in one direction, one going in the other direction. One is male and one is female. I’ve been working to heal the planetary grid, chakras, vortices, below ground to 10 mile depth and above ground 10 miles up. I’ve been finding good results too with grounding my heart chakra to the center of the earth. Not via straight lines however, but rather using a vesica pisces (cat pupil shape) curved, feminine lines. Going from left side of heart chakra down to center of planet, and from there, back up to the right side of heart chakra. Stevo got attacked really hard after he started doing this meditation, so I think he’s onto something. I hope you will try it and add to it. Thanks for the link Jacques….it’s great confirmation! Something good to find targets is to ask the conscious in the planet to track the attackers. If you can not “attach” energetically yourself, ask the planet, which is aware of everything that happens in it, to find it and help you get it. Thanks Albert, that’s a good idea!